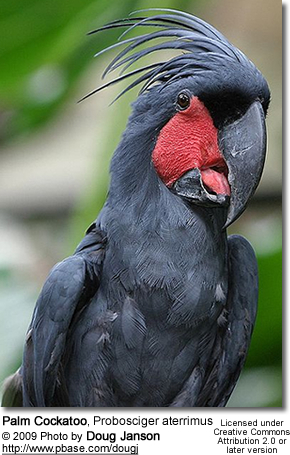 The Palm Cockatoo (Probosciger aterrimus), also known as the Goliath Cockatoo, is a large smoky-grey or black parrot of the cockatoo family. It is the only member in subfamily Microglossinae and the only member of the monotypic genus, Probosciger. 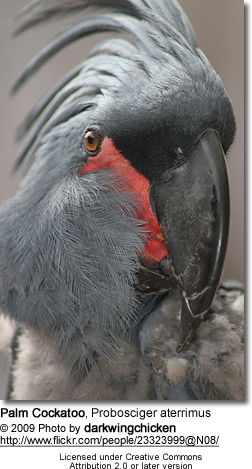 Its unique position within the cockatoo family has been confirmed by molecular studies (Brown and Toft, 1999, Astuti, 2004). The Palm Cockatoo is 55–60 cm (22–24 in) in length and weighs 910–1,200 gm. 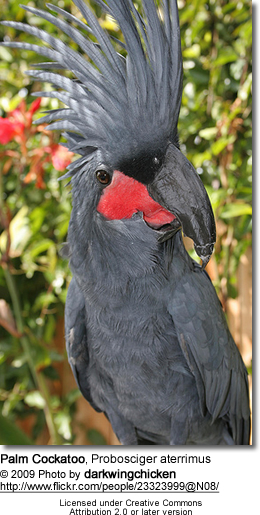 It is a distinctive bird with a large crest and has one of the largest bills of any parrots (only the Hyacinth Macaw's is larger). 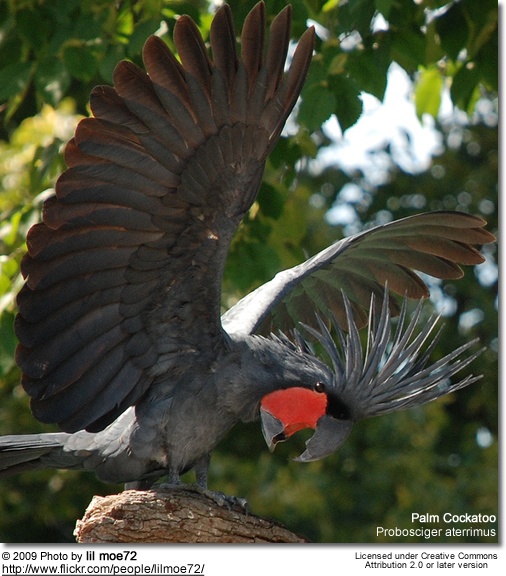 This powerful bill enables Palm Cockatoos to eat very hard nuts and seeds that other species have difficulty accessing. The bill is unusual as the lower and upper mandibles do not meet for much of its length, allowing the tongue to hold a nut against the top mandible while the lower mandible works to open it. 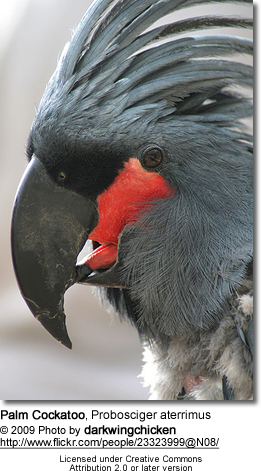 The Palm Cockatoo also has a distinctive red cheek patch that changes colour when the bird is alarmed or excited. 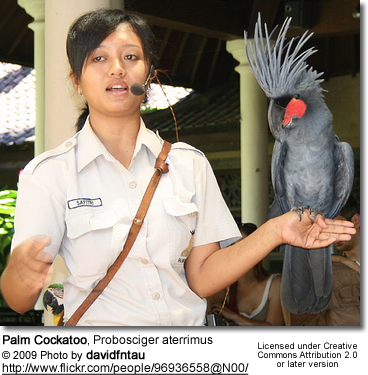 The Palm Cockatoo makes four different kinds of vocalisations, including a "hellow" call that is surprisingly human-like. There are distinct dialects throughout the species' range. It has a unique display where the bird (typically the male) drums a large branch against a dead bough or tree, creating a loud noise that can be heard up to 100 m away. It is possible that females can assess the durability of the nesting hollow by the resonance of this drumming display. Palm Cockatoos only lay one egg and have one of the lowest breeding success rate reported for any species of parrot (Murphy et al. 2003). Off-setting this is their very long life-span. 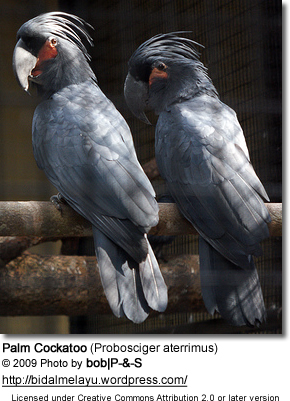 Captive Palm Cockatoos can live up to 90 years of age, but wild Palm Cockatoos are thought to live up to 40–60 years of age (Heinsohn et al. 2009, in press). Breeding takes place inside tree hollows, which are typically like standing pipes. Fires play an important role in the destruction and creation of nest hollows. Fires allow the colonisation of microorganisms and termites which enter the tree and start hollowing out the inside. Cyclones are important in the final stage of nest hollow development.